Product Spotlight: Adjustable Table Stand for Supporting Flexible Fume Extraction Arm - Sentry Air Systems, Inc.
at varied heights from the welding table. 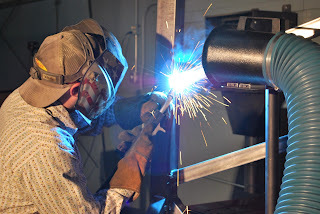 As welders move their torches to different areas, they can use the adjustable stand to position the extractor hood precisely where welding fumes are being released, helping to create a safer working environment. Adjustable Height Stand being used with a Model 400 Portable Fume Extractor with Flexible Hose. 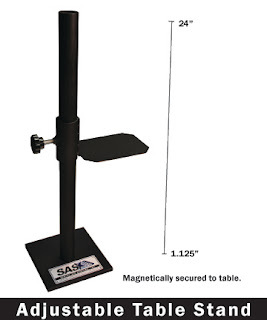 High-powered magnets securely hold the carbon steel stand to the table. The stand’s horizontal platform is vertically adjustable from 1.125 to 24 inches, which provides maximum flexibility for most welding jobs. This accessory is typically used with Sentry Air Systems Model 300 Portable Floor Fume Extractor, Model 400 Portable Floor Fume Extractor]. 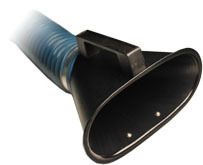 The magnetized capture hood on this hose allows the inlet to be strongly secured to the steel platform for hands-free operation. 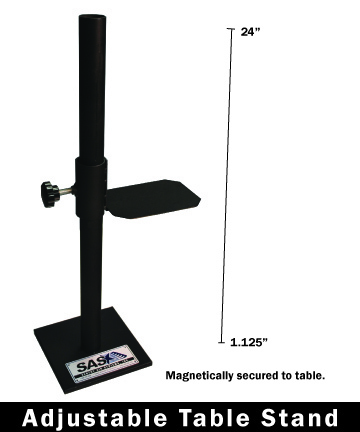 The Sentry Air Systems Adjustable Table Stand can also be used for a variety of additional applications including powder-based processes, soldering, and an array of other operations that emit particulate. Specialist contact you to discuss your process.